Initially dedicated six months following the dedication of their new church building, the pipe organ at First United Methodist Church has a long and storied history. Having gone through many updates, improvements, and restorations over the last several decades, the organ remains a highlight of religious music culture in Salt Lake City, Utah. Perhaps the most nationally recognized organ in Utah is found at the Mormon Tabernacle on Temple Square. However, First United Methodist Church in the heart of downtown Salt Lake City, Utah is home to the oldest pipe organ in the state that features the most original components in their original location. The church building on the corner of 200 South and 200 East was built and dedicated in May of 1906. The dedication of the original church organ, made by George Kilgan & Sons, followed seven months later on December 7, 1906. 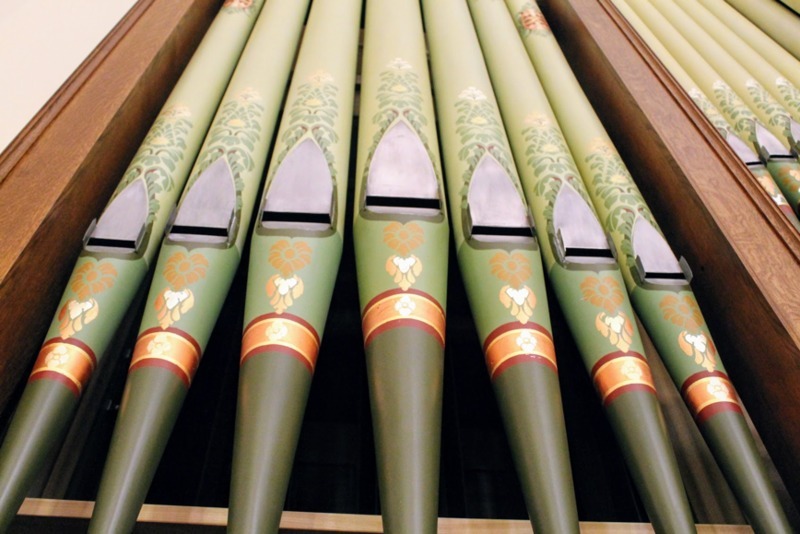 The organ featured pipes painted in shades of green and highlighted by intricate stenciling, as well as a console close to the organ choir that faced the congregation. Between 1915 and 1960, the organ underwent enlargements, various color changes accentuated by gold paint, as well as the movement of the console closer to the congregation on the main floor of the chapel. During the period of 1924–1939, the First United Methodist Church organist and choir director was Dr. Frank W. Asper, who also was an organist for the Mormon Tabernacle during the years 1924–1965. The organ underwent significant renovation during what is called the sanctuary and chancel beautification project. A notable change to the organ included moving the organ pipes behind a screen. Further, the pipes were hidden by a wooden grill, crosses, and lights that highlighted the new front to the Church chancel and sanctuary. The beautification project also included the incorporation of permanent pulpits and flower boxes. In 2009, First United Methodist Church made the decision to restore the organ back to its original style, parts, and feel as part of a larger effort to remodel and renovate an integral and central component of the church’s community, history, and tradition. At this time, fundraising efforts began with recitals performed by local organists, grants, and a crowdfunding campaign. First United Methodist’s principal organist, Scott Mills, attributes the success of the fundraising efforts to the community, similar to an outreach that led to the building and dedication of the Church building over one hundred years earlier in 1906. Later at the completion of the project, Mills said, “The donations came in from one penny to thousands of dollars. And so, this whole restored effort . 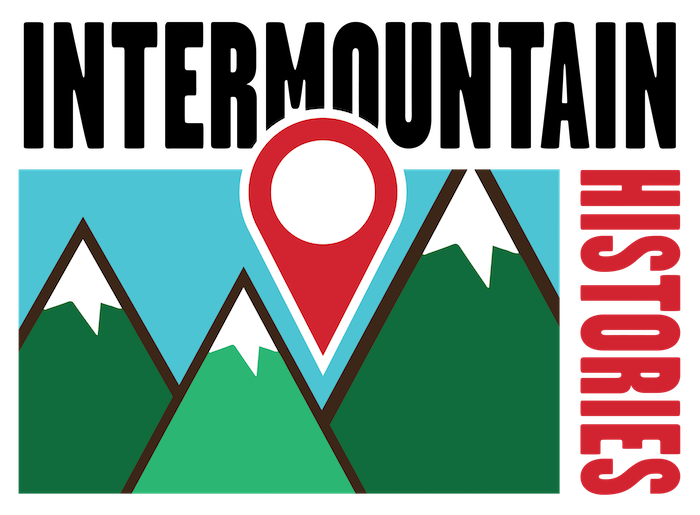 . . it was done mostly by the widow’s mite, literally the widow’s mite was the efforts of people who came together and made this all possible.” By 2014, the church had raised an ample sum to hire local American Fork, Utah based organ builders, Bigelow & Co. The restoration effort consisted of finding necessary vintage parts at the local Salt Lake Masonic Temple, locating and purchasing a 1930 organ console from Old St. Mary’s Catholic Church in Cincinnati, Ohio, and the hiring of Tony Devroude to recreate the original stenciling on the organ pipes. In addition, the 1960 paneling and carpeting was removed, opening up the chancel area and exposing the organ façade. The organ console was dedicated to the memory of the 1924–1939 director and organist, Dr. Frank W. Asper. Restored to its original look and vintage composition, the Wesleyan Heritage Organ at First United Methodist continues to serve the local Methodist community, a wide variety of community events, as well as amateur and professional organ recitals on a regular basis. 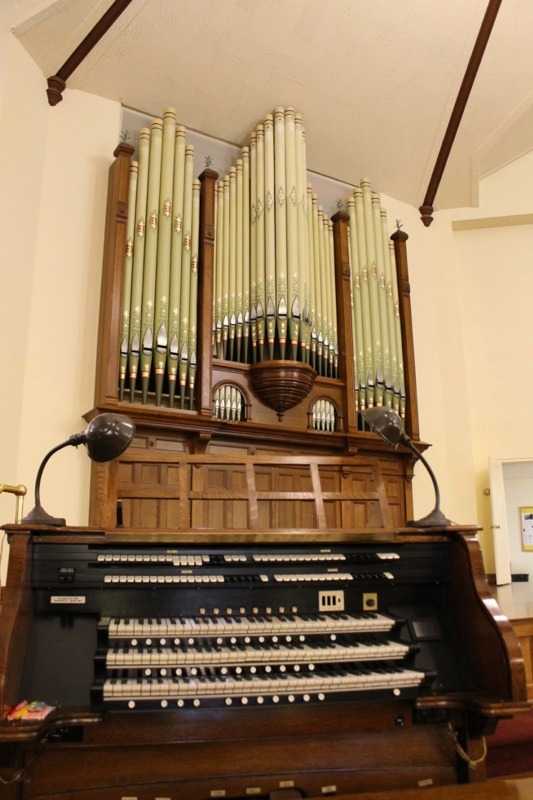 Nicholas Shrum, Brigham Young University, “Wesleyan Heritage Organ at First United Methodist Church: History and Community,” Intermountain Histories, accessed April 19, 2019, https://www.intermountainhistories.org/items/show/154. Christensen, Megan Marsden. KSL.com. “Restoration of 110-year-old organ completed following community’s efforts,” April 6, 2016. Available at https://www.ksl.com/?sid=39209737&nid=148. Hollenhorst, John. Deseret News. 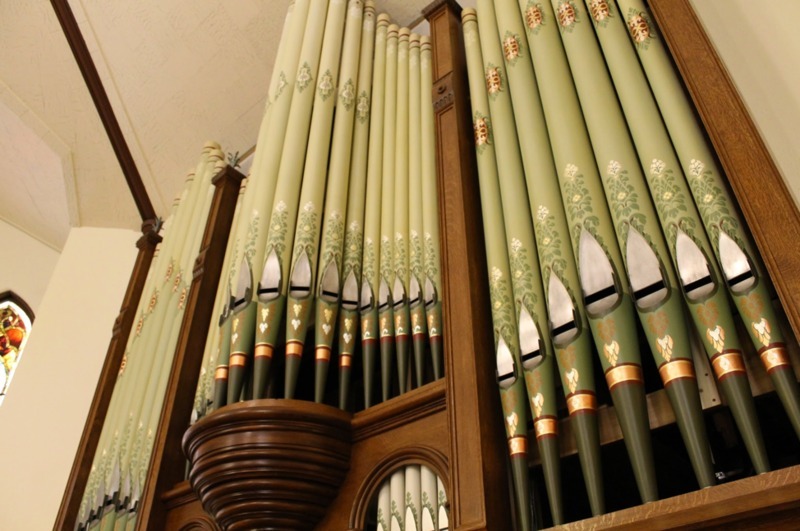 “The Pipes Are Calling: Salt Lake Methodist Church Looks to Restore 107-year-old Pipe Organ,” Last modified December 9, 2013. Available at https://www.deseretnews.com/article/865592087/The-pipes-are-calling-Salt-Lake-Methodist-church-looks-to-restore-107-year-old-pipe-organ.html. Mills, Scott R. “Cover Feature: First United Methodist Church, Salt Lake City, Utah,” The Diapason (December, 2015). From Bigelow & Co. Organ Builders. “Opus 38,” available at http://bigeloworgans.com/opus/38-specs. Sachrov, Al. From Utah Stories. “Church Organs of Salt Lake City,” available at http://utahstories.com/2011/12/organs-of-salt-lake-city/.